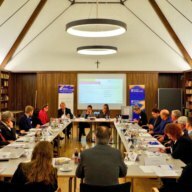 On Monday, 29 October and Tuesday, 30 October 2018, the German-Hungarian Expert Meeting on the topic of “Germany and Hungary in the EU-27” took place in the Protestant Monastery of St. Augustine in Erfurt. 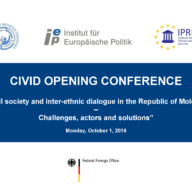 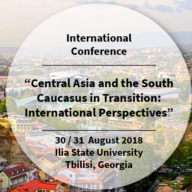 On Monday, October 1, 2018 the Opening Conference of the project “Promoting civil society and inter-ethnic dialogue in the Republic of Moldova in the context of the EU association process (CIVID)” will take place in Chișinău. 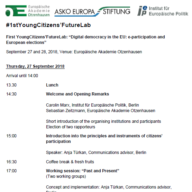 The Institut für Europäische Politik (IEP) hosts the #1stYoungCitizens’FutureLab at the Europäische Akademie Otzenhausen (EAO) on 27 and 28 September 2018. 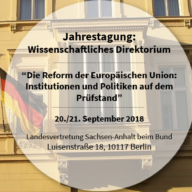 The IEP as a scientific partner, together with the Europa-Union Deutschland, will organise the next Civil Dialogue in Halle on Thursday, 30 August 2018 under the title “And now, Europe? 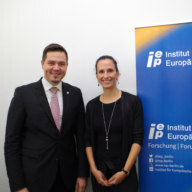 We have to talk!”.